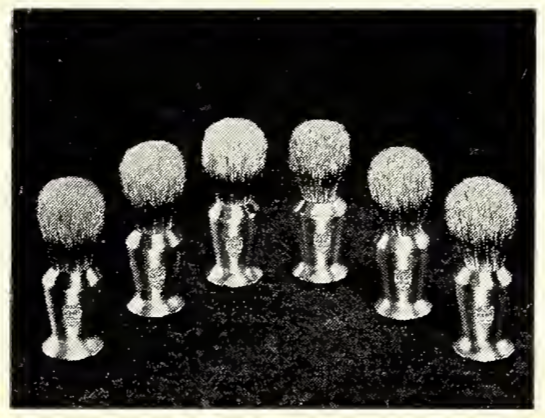 New to me: Steel handle brushes from Kent, back in 1972. Also, the V seems to refer to "vase handle" in the other, more familiar Catalin brushes from around the same period (as in V10, etc). I didn't know that until now. Ok, the images are poor, but they are lifted from a copy from a 1972 magazine. Wouldn't you love to have one of these? Very cool. I wonder how heavy these were? I haven't seen any of these floating around. I wonder how many were made. Wow! They were ahead of their time. Cool indeed. I also wonder about the weight. If the stainless was thin and hollow, the weight may not have been an issue. Since they are spun, they are hollow and should not weigh too much. Being thin-walled and hollow, you'd think a loaded brush would be a bit top-heavy and fall over. Who knows. Maybe that's why they didn't catch on or something. I expect one of these will turn up one day, now we know they existed. That weird magic seems to happen sometimes. I have seen this process several years ago at one our customer's site, they made large Aluminum lamps (shades!!) like they are used on high lamp posts in parking lots. Was very interesting to see as I am a wood turner. There is also several decent videos covering metal spinning on YouTube - seems like a reasonable easy skill to learn, but one that is hard to master.